Many of us here on Freelancer know what it’s like to start your own business; countless sleepless nights, waking up from a dead sleep with another new idea, and putting all of your effort into making your company a success. Though our offerings may be different, we all share a common objective, to get better and to make it work! When you’re ready to begin crafting your business image, it is imperative that you find your voice. It would make no sense if a professional accounting firm’s website looked like the old MySpace account of a teenage grunge band. You need to create a congruent and professional image that sets the tone for your company. 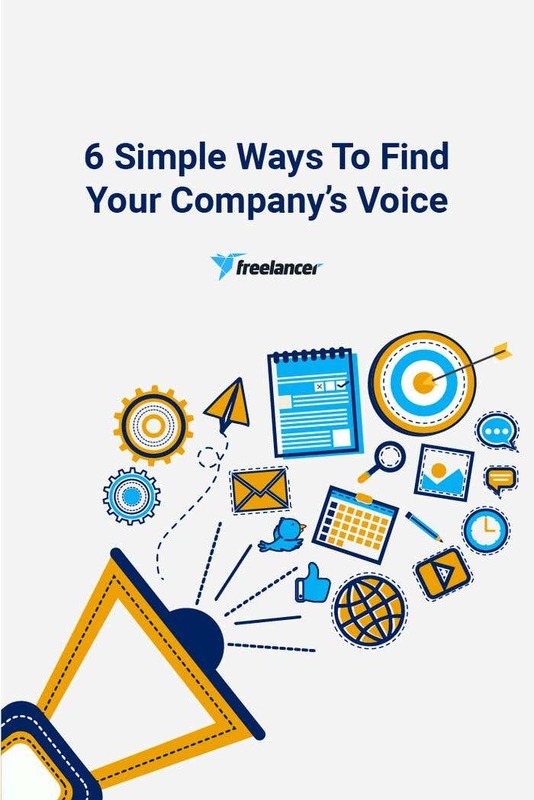 Below are a few easy ways to find your voice. 1. FIGURE OUT YOUR VIBE: You know your company best. Though you may not have all of the stats showing who your ideal consumer is (just yet), you should understand the feeling and clientele that you’re trying to reach. Work to express that in your own writing or by telling your copywriter or designer exactly who you’re marketing your product or service towards. If you are a professional service, SOUND professional! Offering a new age product? Aim for a more relaxed, hip vibe. 2. TELL YOUR STORY: This one goes along with tip numero uno. No one knows the heart of your business better than you. To find your unique voice, tell your own story. A compelling About Us page, or personal photos and experiences on a company Instagram can go far in creating relationships with customers and clients. 3. FOCUS ON YOUR KEYWORDS: Think of a few keywords that you like, words that resonate with you and your brand. Is your company edgy and modern? Look up synonyms for those words and make sure that you’re evoking that image throughout your content. Words like sleek, new, fresh and contemporary are some great ways to begin. Incorporate these words and feelings throughout your text to elicit the right response. 4. CREATE COHESIVE BRAND IMAGING: When developing your brand, it is important that all parts look and sound cohesive. Contemporary brands need fresh photography, copy, style and even font. Finding the right fonts and styles can be done with a simple search engine query, or by the vibe the look gives you. This is also the perfect time to do a little research and study your competition. Just remember not to copy or emulate, simply use your research to get an idea of what looks and feels right to you! Professional Copywriter Hint: Chalkboard Font might not be the best choice for your new Med Spa’s latest ads. 5. TORMENT YOUR FRIENDS OR ASSOCIATES: This part sounds scarier than it actually is. After awhile of reading your own words for the thousandth time, they all start to run together. Sometimes I look at my words at 2 in the morning and I can’t tell the good from the bad. Usually, I leave my writing alone for a day and look at it once it’s cleared out of my recent memory. As a final edit, I always ask a trusted friend or colleague to take a look at my work and see what they think. You need someone honest for this task. You know that friend that always tells you the things you don’t want to hear? They’re the right choice. 6. WHEN IN DOUBT, FREELANCE IT OUT: At the end of the day, we all have special talents and strengths. If yours happens to be dreaming up the business and not writing the content, outsource it to someone who has experience doing just that! With minimal effort, you can find website designers, content writers or SEO marketers who have the skills and resources to help build your business. And let’s face it, a lot of us Freelancers just have the gift of gab. Use these steps to find a voice that can carry through to all parts of your brand. However, you choose to express that voice, creating a cohesive platform will allow you to connect with and engage your clients. Copy editing & writing. Exceptional copy, On time.